The problem with most modern living spaces is that they’re just not geared up for home theater. When most people live in an apartment, or a moderately sized house, there’s no such thing as a dedicated media room. Chances are, the entertainment center is stuck in the lounge, or jammed into the bedroom. As much as we’d love to stick a 5.1, a 7.1 or - what the hell - a 9.1.2 system in there, sometimes it just isn’t possible. Space and acoustics don’t allow for it. Not to mention that most landlords will probably take a dim view of you installing speakers in the ceiling. Into this particularly problematic area step speaker maker SVS. They’ve proven themselves to be a forward-thinking company who know how to build good products, and with their latest, the SVS Prime Elevation speakers, they’ve managed to solve a very tricky problem. From the back, the Prime Elevations don’t look different to any other speaker. You get a pair of binding posts, a mounting port (which we’ll talk about shortly) and a rear bass port – so far, so conventional. But it’s when you flip them around to the front that they show a deceptively-simple design feature that makes all the difference in the world. Most speakers have a flat face. The Prime Elevations’ face is angled to about 110 degrees, with the 1” tweeter and 4.5” polypropylene woofer pointing out at the same angle. You might wonder why we’re making such a big deal out of this – it is, after all, merely the act of tilting the speaker face. But such a simple design change means that you can, effectively, place the speakers anywhere, and get a range of different effects. No matter how big or small your entertainment area is, the possibilities will open up. Over the month or so that we had them, we tested the Prime Elevations in just about every position we could. 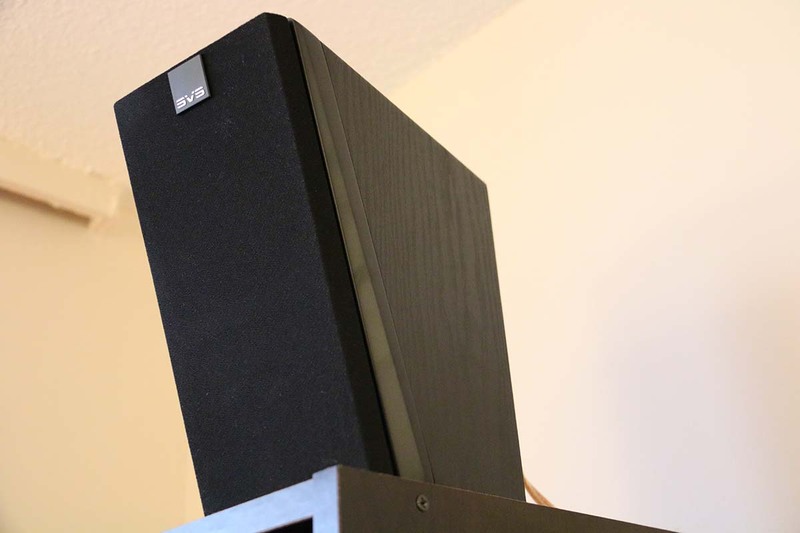 They are primarily designed to function as height speakers in a Dolby Atmos setup (or similar), but the angled face lets you simulate this even if you can’t get them too high up. You can place them on high bookshelves, pointed downwards. Put them beneath the TV, pointed upwards. You can use them as surround speakers on the sides. No matter which way you choose them, the angled design means that you don’t have to place them at ear-level – a boon for anyone with a small or oddly-sized room. You can even, if you’re so inclined, place them in the centre speaker position in dipole or bipole formation (if those terms don’t make sense, there is an excellent explanation here). A word on mounting. SVS include mounting brackets for each speaker, so that you can get them attached to the wall. Full disclosure: we didn’t do this, not because we didn’t want to, but because the walls of our apartment are off-limits to screws thanks to the policy in our apartment block. As much as we want to bring you the fullest exploration of a piece of equipment’s strengths and weaknesses, we weren’t planning on risking our security deposit. From what we could tell, the mounting brackets were easy-to-use, and we messed around with them as much as we could to get some idea. In any case, it hardly mattered: we were having too much fun placing the speakers in different positions, and getting the best effects we could. The drivers themselves are hidden behind a mesh grille, and there’s a metal SVS logo that can be detached and spun around so that the letters are always facing the right way up. It’s a cute if slightly unnecessary detail, but that’s just it: it’s a detail that shows just how much care the company has put into making these. They come in three different finishes: black ash, piano gloss black, and piano gloss white (ours were the ash). Be warned: you’ll pay around a hundred dollars extra for the piano gloss option. It would have been nice to see a few more colors on offer, but this is a very minor point. The build and finish of our review models were great, and we had no complaints. Design-wise, these are almost flawless. Mind you, they’re pretty well near-flawless sound-wise, too. The effects changed slightly based on where we put the speakers - for example, changing the connection from side-surround to height speakers on the receiver we used to test these, the Marantz SR7011, which we’ll be reviewing soon. But overall, the sound was absolutely extraordinary. No matter where we put them, or the kind of surround audio we pumped through them, they handled everything brilliantly. This was a pleasant surprise after hearing so many height-effect speakers, which try to bounce audio off the ceiling, muddy the image. The object based surround sound we got when using these in height formation on a Dolby Atmos setup was extraordinary. And for such relatively small units, the audio quality they delivered was incredibly full and rich. The mid range, in particular, felt like it had real depth and body to it, the sound leaping out the speakers and filling up the room. It was rounded off by crisp, clear highs that really did justice to whatever we put through the speakers. Although the bass isn’t going to touch that of a dedicated subwoofer, it was impressive enough. The depth and detail of the soundstage was phenomenal, so much so that it almost fooled our ears into thinking we were listening to a much more powerful set of speakers. We were also pleased with how well the Prime Elevations fit in with our existing speaker setup, complementing the base soundstage while at the same time broadening and enhancing it. Although these will probably be best when used alongside other SVS models, there’s nothing wrong with inserting them into an existing setup, and taking, say, a small 5.1 system to the next level. While we didn’t have an Auro3D setup to test this on, we did run it through several tests using Dolby Atmos and DTS:X. It never put a foot wrong. These are, in every way, a superb-sounding set of speakers. Getting started with a basic 2.1 system? Stick these on either side of your TV with the subwoofer underneath. Expanding a 5.1 setup? Put these on the side of the listening position, or in the height position to create a dynamic 7.1. Even if you have a full 9.1 or 11.2 setup, these speakers will slot in perfectly, as long as your receiver can take them. You could quite conceivably buy four, and use them as height effect speakers. We were blown away by how good these were. While some might consider them a little pricey at just under $200 each, we’d argue they offer superb value for money. Not just because the sound they deliver is exquisite, but because they offer so many possibilities, and can adapt to so many circumstances. Whether you’ve invested in home theater, or you’re thinking of getting started, you should take a very good look at these – no matter how big or small your apartment is. Although the sound isn’t quite as good, these up firing Dolby Atmos modules are slightly cheaper, and are good enough to warrant inclusion as a worthy alternative to the SVS speakers. The similarly-sloped face and the Andrew Jones-designed cred make these a worthy competitor to the SVS. They are not as versatile, but they offer more powerful and well-rounded sound. And they're heavy, so take care. SVS Prime Elevation $199 Each 7.8lbs 20-150W 8Ω 87dB 1 x 1", 1 x 4.5"
Onkyo SKH-410 $120 Pair 6.6lbs 37-150W 6Ω Unknown 1 x 3.25"
ELAC A4 Debut Series $230 Pair 14.3lbs 20-80W 6Ω 85dB 1 x 0.5", 1 x 4"
*RAP = Recommended Amp Power in Watts Per Channel. Confused? Explanation here!